Packaging and Material Handling Equipment for EVERY INDUSTRY! The Doboy JSL uses constant-heat, steel jaws and a unique mechanism to simultaneously fold / apply a header label and seal small bags. It can also punch a hanger hole & emboss lot/date code on your bag - all in one step! 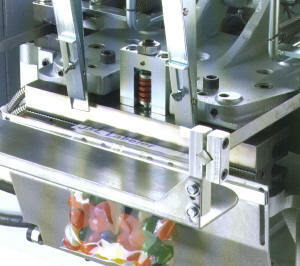 The JSL is an excellent way to automate operations where header labels are now manually applied and sealed or stapled. Call Us for Access to a JSL Video! Can't find what you need? Drop us an E-mail describing your application or fill out our Information Request form. We'll contact you to let you know what's right for you. Serving customers in Connecticut, Delaware, Maine, Maryland, Massachusetts, New Hampshire, New Jersey, New York, Pennsylvania, Rhode Island, Vermont, Virginia, and Washington D.C.
Use webmaster@baggingguys.com to send us any feedback or comments about this site. NOTE: Information provided on this page is for general reference only! Specifications & features listed on BaggingGuys.com web pages, as well as details illustrated in drawings and photos herein, are subject to change. Refer to proposal for actual, current product information.